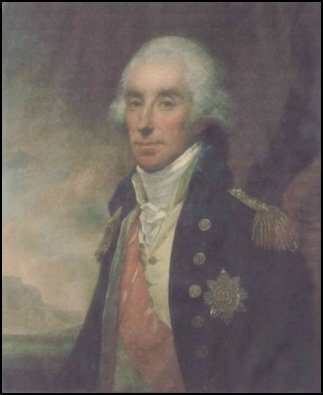 Viscount Keith, Knight of the Bath, Admiral of the Red (which at that time was the foremost rank in the British Navy) died on March 10th 1823 at the age of 77 in his home at Tulliallan. He was born on January 12th 1746 at Elphinstone Tower (now known as Dunmore) just across the river from Tulliallan, youngest son of Lord Elphinstone. The Honorable George Elphinstone, as he was then, joined the navy as midshipman in 1762 during the 7 years war with France and achieved the rank of lieutenant in 1767. He saw active service in the American War of Independence, rising to the rank of Post Captain in 1775. In 1793, at the commencement of the French Revolutionary War he was appointed to the Mediterranean where he took command of the land forces holding Toulon. When the British forces withdrew from Toulon he successfully organised the complete evacuation of all troops under his command, including the French Royalists. It is interesting to note that upon this operation he had his first encounter with a then obscure but very able French Artillery officer by the name of Bonaparte. Captain Elphinstone returned to England in 1794 where he received a knighthood and was promoted to the rank of Rear Admiral. In 1795 he commanded the expeditions which captured Cape Town and later Celon, for which services he was appointed to the rank of Vice Admiral. Sir George Elphinstone joined the Mediterranean fleet as second in command to Lord Vincent in 1798 where he particularly distinguished himself in restricting the unification of the French and Spanish fleets although they outnumbered him by nearly 3 to 1. In 1801 he succeeded Lord Vincent as Admiral in command of the Mediterranean fleet and, following the victorious operations of Genoa and at Aboukir Bay, he was made peer of the realm. Lord Keith was appointed to the Command of the North Sea Fleet in 1803 and in 1812 took Command of the Channel Fleet. After the Battle of Waterloo he again renewed his aquaintance with Napoleon Bonaparte when he succeeded in blocking his escape by sea and conducted him to his incarceration upon the island of St Helena. The estate of Tulliallan was purchased in 1798, mainly from prize money obtained by the capture of enemy shipping. The original Tulliallan Castle, a converted 13th century fortress was a roofless ruin and it was not until 1812 that the construction of a new Tulliallan Castle, an impressive 19th century mansion house, commenced, to be completed in 1820 a few years before his death in 1823. Lord Keith had been twice married, first in 1787 to Jane Mercer of Aldie who died in 1789 leaving a one year old baby daughter, Margaret. Secondly in 1808 when he married Hester Maria Thrale (referred to in the works of Dr Johnson as ‘Queenie Thrale’), by whom he also had one daughter, Georgina. In 1817 his eldest daughter Margaret, who had inherited the title as Baroness Keith, married the Count de Flahault, former aide-de-camp to Napoleon and later French Ambassador to the Court of St James. To say that this marriage did not please Lord Keith is very much an understatement. He had spent his life fighting the French and had no intention of allowing his estates to be inherited by one of them. This is made obvious in the stringent terms of his Will which ensures that the estate can only be inherited by persons, “educated as a Protestant in the United Kingdom, under no allegiance to any Foreign Power, nor holding any commission of service to any Foreign State”. Consequently Baroness Margaret Keith held Tulliallan in trust as life rent only and upon her death it passed to her younger sister Georgina who was married to Lord Osbourne. As Georgina had no children, upon her death the estate passed back to her eldest neice Emily Jane de Flahault who was married to the Marquess of Lansdowne. The Castle remained in the Lansdowne family until 1900 when it was sold to Sir James Sivewright and upon his death to Sir Harold Mitchell. It was later purchased by the Scottish Office and is now the Scottish Police College.